Provides substantial and stronger water current to improve pond water circulation and oxygenation. With more impellers than the normal model, which can benefit a large breeding area, thus, less power consumption and less investment cost. Few aerator is needed . reducing maintenance and labor costs. 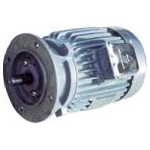 The unique aerator motor made under "ISO9001" and "ISO14001" System. Strong and durable "Worm Gear Wheel" (Above "CNS" Standard) and "Input Shaft". "Double Bearing" on each side of Output Shaft, Wide Gear Worm Gear Wheel used to provide better torque output and durability.